Spartans Community Football Academy wins National Youth Work Award. We are excited and proud to have been recognised in the recent Youth Link Scotland National Youth Work Awards. YouthLink Scotland represents over 100 organisations, including the 32 Local Authority Youth Work Services and voluntary youth work organisations, which support over 350,000 young people in achieving their potential. Every year YouthLink host an awards evening to celebrate and highlight some of the inspiring youth work projects and youth workers from around Scotland. This year Spartans Community Football Academy was the winner in the "Youth Work in a Different Setting" category. 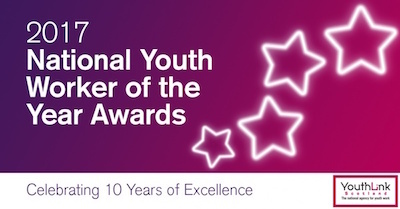 This award recognises organisations whose programmes and values are underpinned by a strong focus on youth work but who are not solely youth work focussed. Youth Worker Stuart Stout and Youth Work Manager Kenny Cameron attended the awards evening to accept the award. Kenny remarked that: "It's really great to be recognised by YouthLink Scotland, and gives us a real boost as an organisation. It was especially good to see fellow youth work organisations The Citadel and Pilton Youth and Children's Project - also from North Edinburgh, receive runners-up awards."